The Honor Magic 2 is a premium smartphone with a suitable price and offers many good features but a few of the average ones. The cameras are very appropriate for capturing moments perfectly. The device also has more great features like huge RAM, great processor, etc. The device does not feature any external storage which is disappointing as the users need a huge storage space from a premium device. The battery on the device is also a little below the par, as the display and the configuration on the device need a good amount of power to give a decent backup. The Honor Magic 2 flaunts a stunning display of 6.3-inch with a resolution of 1,080 x 2,340 pixels and a pixel density of 403 PPI that can render immersive vision. The display type is AMOLED which offers the aspect ratio of 19:5:9 and it is protected by Corning Gorilla glass. The user sure is gifted a premium display with the best of features along with damage protection. The device sports an excellent dual rear camera of 16MP + 24MP resolution with a lot of other features. The front camera offered by the device is 16MP + 2MP resolution and it comes with an LED flash. The device is powered by a 3,500mAh Li-Polymer battery which also supports fast charging feature. The Honor Magic 2 holds two SIM cards out which, one supports 4G VoLTE networks and the other one supports 2G networks. The device also features some more connectivity features like WiFi 802.11 b/g/n, Bluetooth v5.0, NFC, A-GPS and a lot more. The internal storage offered by the device is 128GB, however, the device does not feature an external storage but helps with USB OTG support. The Honor Magic 2 runs on two Cortex A76 dual-core processors with clock speed of 2.6GHz and 1.92GHz along with a 1.8GHz Cortex A55 quad-core processor. The processor and a 6GB RAM are seated on a HiSilicon Kirin 980 chipset and a Mali-G76 MP10 graphics card. The configuration looks strong and can deliver a great performance. 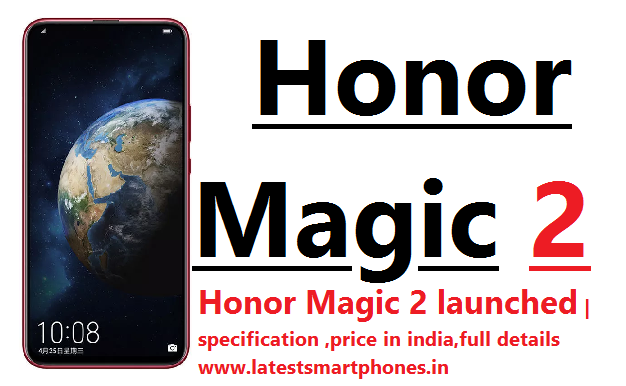 Honor Magic 2 price in India is expected to be Rs. 40,290. Honor Magic 2 Expected to be launched on Dec 25, 2018. This is 6 GB RAM / 128 GB internal storage variant of Honor which is expected to available in Gradient Black, Gradient Red, Gradient Blue colour.